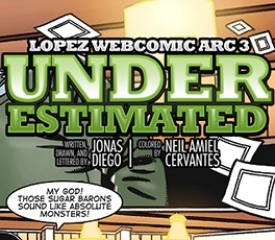 We hope that you are reading the webcomics. This particular arc depicts the story of Don Eñing during the exciting times in the late 1960s, before the Martial Law era. In the politics of war, alliances shift like the fickle winds. In a country beset yearly with devastating thunderstorms, alliances in Philippine politics shift like a typhoon. Whether its survival of the fittest or striving for the benefit of the good, each player in the historic battle that is Lopez versus Macapagal has his own agenda in taking charge of the country’s governance. 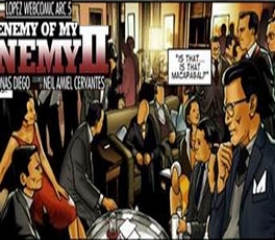 In this page, we find out the exact plan Marcos had in his head the moment he realized how desperate Macapagal is in defeating Don Eñing. 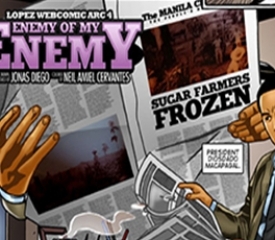 Discover what this is and what role Imelda plays in our story in the latest installment of the Lopez webcomic series “Enemy of My Enemy” (Part 1). 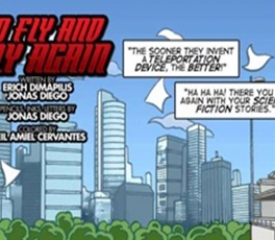 Download the complete version of "Enemy of my Enemy (Part 1)" webcomic to see the rest of the story unfold.